I’ve just confirmed another show at Common Grounds in November and I promise to have a few different songs and surprises. Joining me on Double Bass for this show will be Ted Fordney, and hopefully a few other guests as well. Opening the night will be my good friend Wendy Kaneko. Tickets will be available through the Common Grounds website as ever, just click the link below. As there were no formal sleeve notes to the “Live at Common Grounds “ CD, I decided to post some background notes to each of the songs featured ,here. In part this was inspired by the Songwriters Concert back at Common Grounds in June where I played the tracks and talked a bit more about them.All of the songs on this recording are very personal to me and significantly influenced by my family life , in particular over the last few years. I had originally intended to call this CD “Up Close and Personal ” and I guess that’s exactly what it is . “Angel in the Night” – This song was originally thought up on a drive across Alligator Alley from Fort Lauderdale to Venice after dropping Sandie at the airport. This is one of the most boring sections of road I know at night, with few lights and nothing to break up the darkness for around 70 miles in a straight line, so nothing else to do but think about writing a song ! At the time my Mum had just moved into a care home back in the UK and this was weighing on my mind, and I guess the thought that she was out there and still looking out for me . ‘From Afar” – A few months before she died, I was talking to my sister on the phone and she mentioned that she had some song lyrics that she’d written.She wasn’t sure if they were any good , but said she’d send them to me to see if I could do anything with them . Shirley had always written the occasional poem and a children’s book or two, but never song lyrics. A few days later I received a notelet in the post with these lyrics on, which I parked in my to do folder and didn’t really get around to looking at before suddenly she was no longer with us, and songwriting seemed unimportant for a period . A year or so ago I felt able to look at the song again and with some editing and minor changes I wrote some music to create this song. The style of playing on this song is quite unusual for me using open tuning ( DADGAD) and very sparse chords. “Rose Tattoo”– I grew up on one of the seven hills which make up the City of Bath, and both the street on which we lived and St Georges Ave ( an un-surfaced road where we raced home-made karts without brakes) were frighteningly steep. Our childhood was spent mainly out doors, climbing trees building dens, and having fights of varying scales with a close group of friends and our siblings . I’ve had the chance to return to these streets a couple of times and everything appears on different scale, to my memories as a child plus “the Green” is no longer trees but a private drive, Georges Hill has a tarmac finish , and my best friends garden is now a roadway. The verses of this song tell a bit of that story , and the chorus is me reflecting on the times spent with Shirley growing up. After she died I would often sit out in the garden at night with a small glass of whisky and drink a toast to her. The Rose Tattoo was created by my nephew who is a tattoo artist . He created the design and tattooed it on his Mum’s wrist a number of years ago , and it formed a lasting image for me. 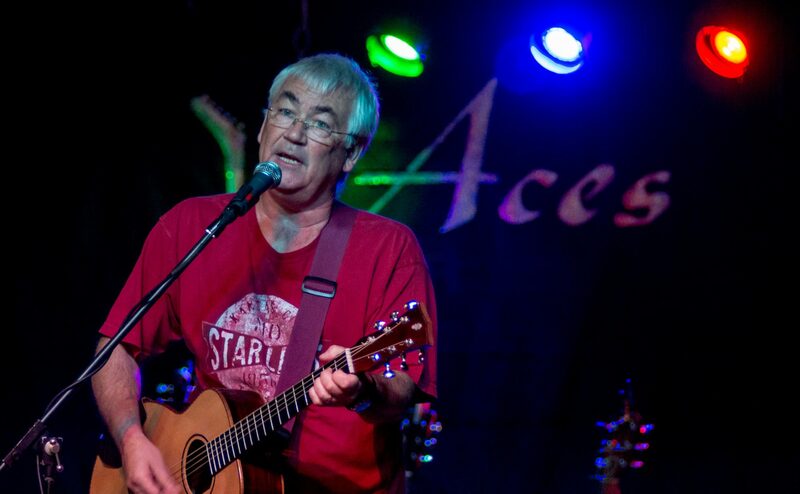 “Life in Words” – This song was written for my Dad. We had a happy childhood with lots of fond memories and he was a big part of those. He was a natural artist , but after attending Art School, he served in the RAF during the war and then took up an apprenticeship as a compositer with the Pitman Press in Bath, where he worked until he retired. In those days books were printed using Letterpress , so every page was created in from individual lead type letters assembled in a print frame . Apart from being very laborious everything was backwards so he became skilled in the art of reading backwards . There are lots of references in the song which hopefully this explains : ” Tinkers to Turrets” = the title of my Dad’s autobiography of his early life and experiences in WW2 . ” Frailty and Pain” = A song I wrote about the effects of arthritis , which had been played at his funeral. “Bonfire night” = November the 5th in England where we celebrate Guy Fawkes and a failed attempt to blow up the Houses of Parliament . ” Bats and Jacks” = Two particularily exciting and dangerous fireworks from my youth . They inevitably were unpredictable and flew into the house where we were sheltering much to Dad’s amusement .Health and safety have unfortunately banned these now , and spoilt the fun. “Solsbury Hill” = The one made famous by Peter Gabriel, which was the view directly from my parents window and my Dad would sit and look out on it all day after he retired. “Wind Across the Water” – The world our children are growing up in is clearly very different from the one we grew up in , with different dangers and challenges. I wrote this one day when I was not feeling great , and I wanted to write down the things that are important for them in life, and send a message that whatever they do , the most important thing is to enjoy it , be safe and be happy , but take the experiences life can offer . Hopefully they will always be able to think back to happy times and feel they have a “home” they can return to with us. This concept of home is not about the physical bricks and mortar but more about people and memories . It’s intended as a positive note to finish the CD. 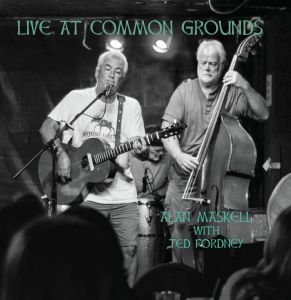 After a successful show at Common Grounds Meeting Hall in Northport in November 2016, Ted Fordney and I returned one day to an empty hall to record a number of songs “Live”. With RJ Malloy in charge of the desk we recorded 5 original songs as single takes with just guitar, vocals and double bass . The sound quality and clarity is pure and unadulterated giving an intimate feel to the songs. CD’s are available from June 16th onwards at any of my shows for $5 , or can be downloaded from my Bandcamp site. Welcome to the new website for Alan Maskell !